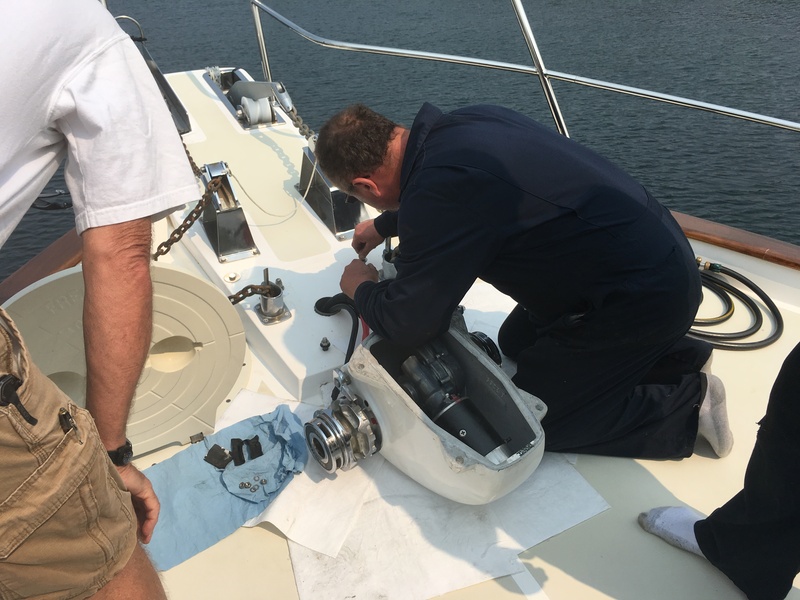 Altech Marine has our windless repaired and finish re-installing it by 1 pm. A few minutes later we are away from the docks and on our way. 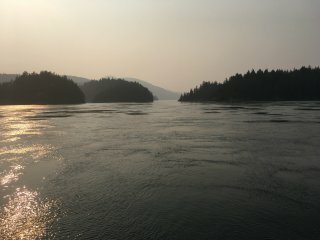 We are leaving Desolation Sound and heading north towards the Broughtons. One could spend months in Desolation Sound with its multitude of anchorages. We plan to explore this area more on our return trip in a few weeks. We have been told that the crowds start thinning out in late August. 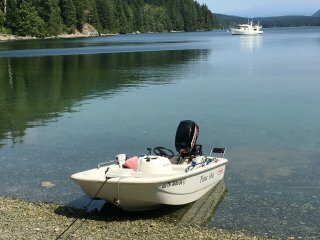 Many boaters make Desolation Sound their turn around point and never venture north of here. To reach the Broughtons, one must pass through several tidal areas. Because of the many fjords and the maze of narrow passages combined with the large swing in tides ( up to 14 feet), currents ebb and flood over twelve knots at some of narrow junctions . 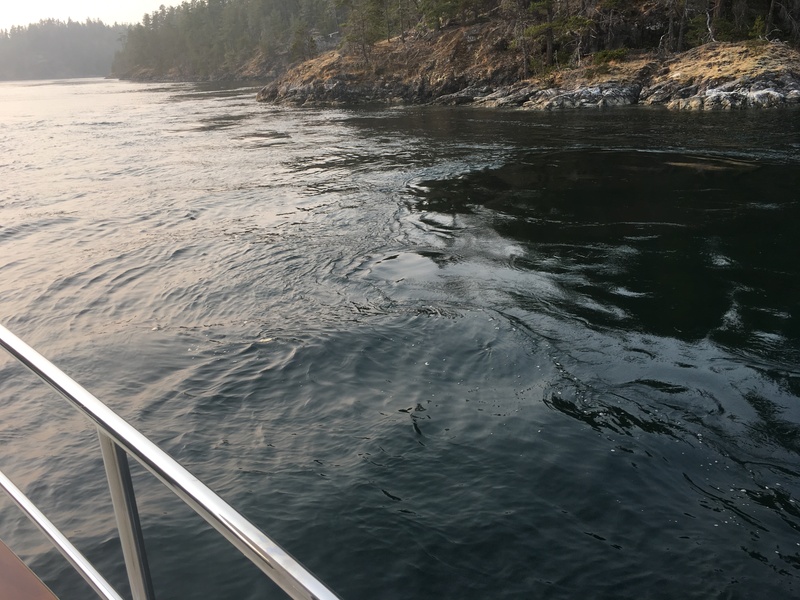 Some have whirlpools larger than our boat along with many rocks lurking under the surface. These rapids are major obstacles that can not be ignored especially in a boat that only goes eight knots. Slack tide which occurs twice daily, is really the only time to transit these rapids safely. One must be precise in their arrival time as slack last only a few minutes before the currents reverse. And once they reverse, there is a very short window of time until these currents reach their maximum velocity once again sometimes as short as 4 minutes. We will have a series of these passages to figure out over the next few days. Our first set of rapids is at Surge Narrows later today. 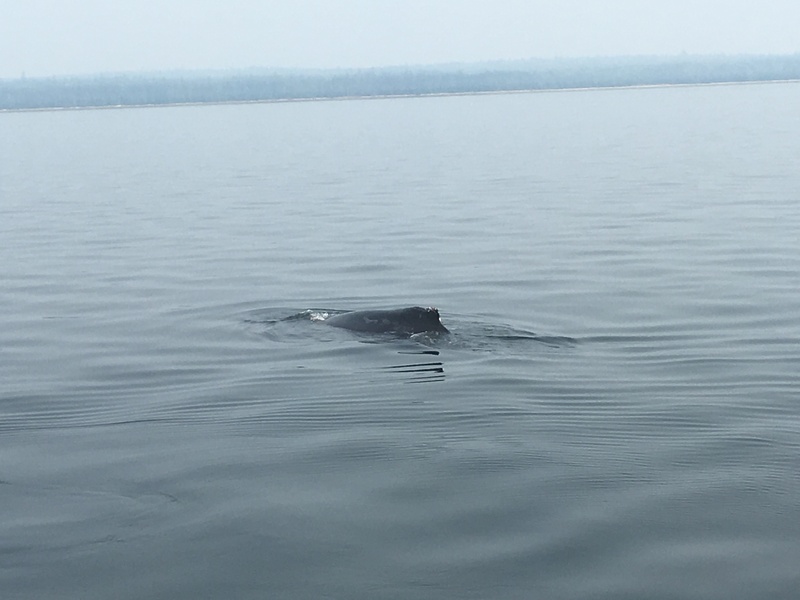 Just a few miles from Campbell River, we spot our first whales of the year. 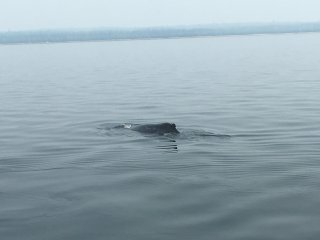 We idle as two humpbacks pass off our starboard side. They seem unconcerned by our presence and continue feeding on the plankton in the deep 700 foot channel. 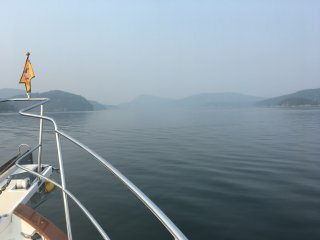 Our path takes us up Hoskyn Channel which I am sure would be beautiful if we were not in severely restricted visibility. 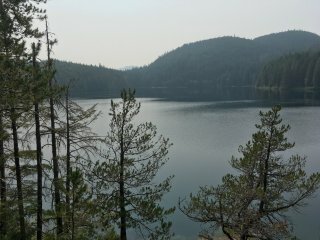 Smoke from the Forrest fires in eastern B.C. has infiltrated this area for the past week. Visibility is less than two miles. 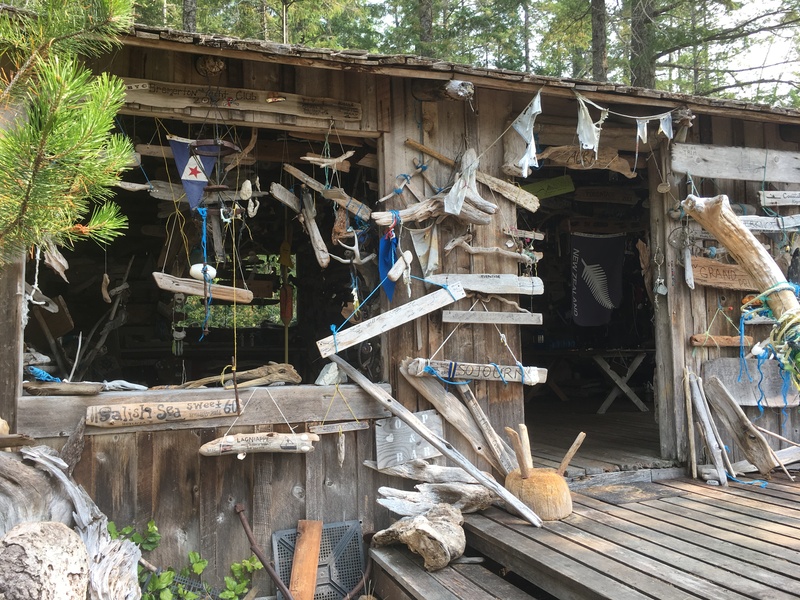 The pilot house is a little tense today as we really don’t know what to expect from Surge Narrows. 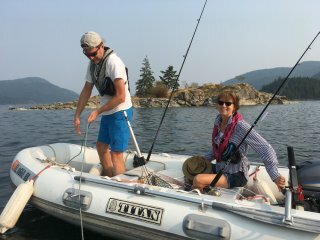 Arriving to Surge Narrows 45 minutes ahead of slack tide, we circle several times. The current is still flooding towards us. As we continue to circle killing time, two other boats arrive. The sailboat continues through the rapids followed by a fishing trawler. We are still 20 minutes before slack but decide to fall in line behind the other boats. Reaching the Narrows, we still have some big whirlpools and Idyll Time gets moved sideways towards the rocks but Jeff is able to keep control of her. With her deep keel, Idyll Time can get pushed around quite a bit with strong current. The rapids are short and we are soon back in calm water. These rapids were not too bad near slack but you certainly would not want to be here any other time. Our anchorage for the next few days is Waiatt Bay, part of the Octopus Marine Park. Our good friends, Wendy and Leigh on the Krogen Forever Exploring are already in the anchorage. This is a great anchorage with beautiful scenery and room for hundreds of boats. 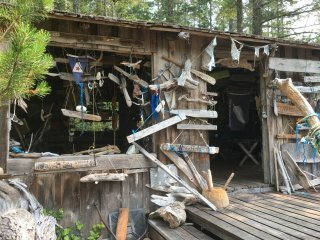 With the dinghy down, we search for an old cabin built in the 70’s located on one of the smaller islands. 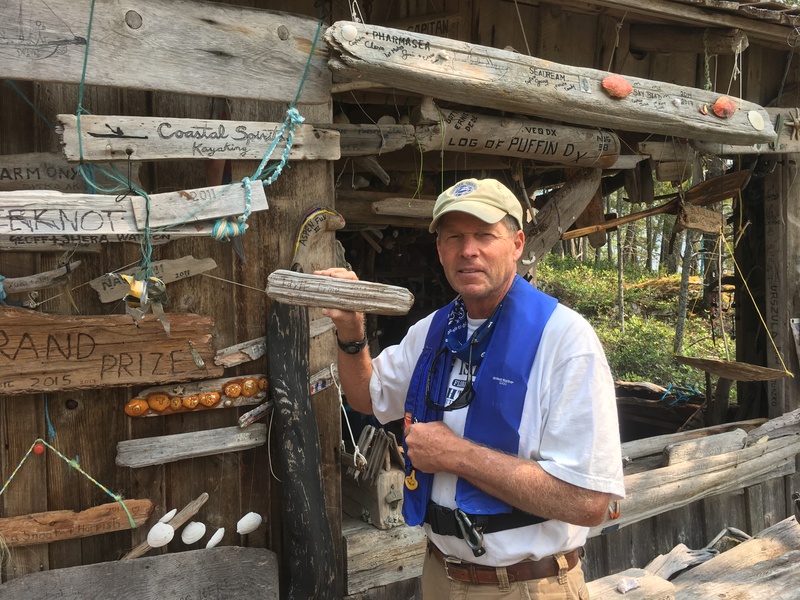 Tradition is for boaters to leave a piece of driftwood inscribed with their boat name and date. 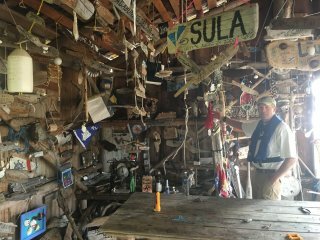 There are literally thousands of these travel mementos inside the cabin. 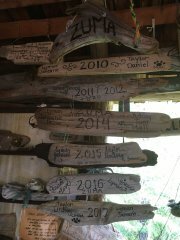 Some boats have many years of visits and log each year by adding an additional piece of driftwood to their original art work. Idyll Time now has her first year added to the collection. 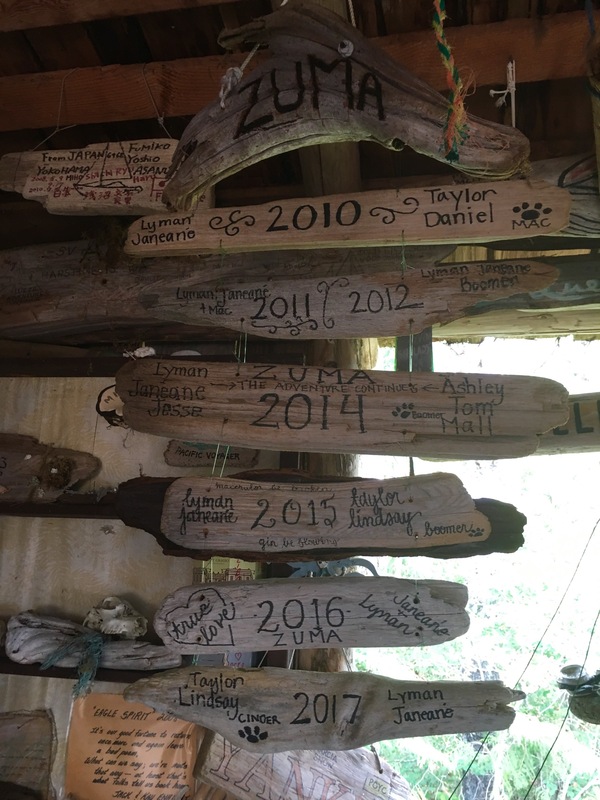 We look forward to adding to our driftwood for years to come. From the anchorage, we do a great hike with Wendy and Leigh to Newton Lake, three miles up the mountain. 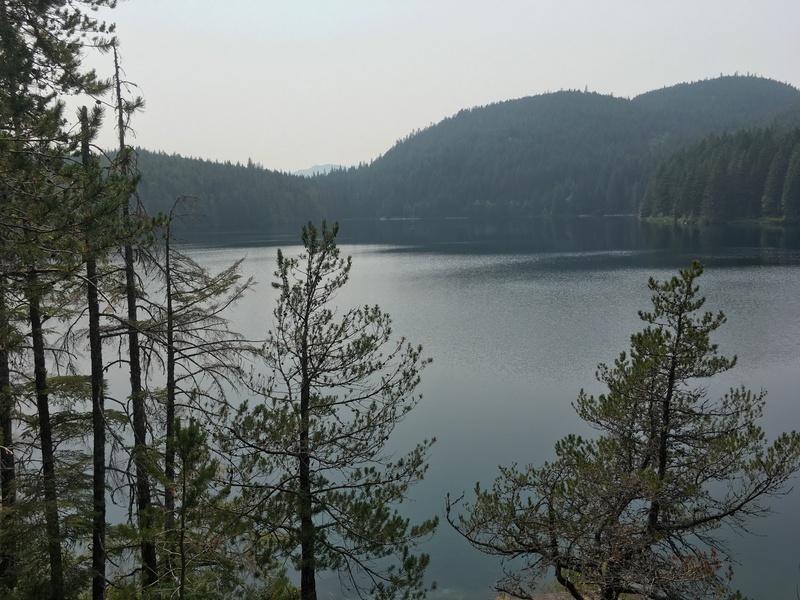 It is a beautiful crystal clear lake and a great swimming hole. When we arrive back to the dinghy several hours later, we find Time Out floating in about four feet of water quite a ways out from shore. Jeff braces himself for the cold water and wades out to retrieve her. The water is really cold! We had though this would happen as we beached the tender at low tide. We knew the tide would be coming in and we brought the dinghy as far ashore as we could. We saw several other dinghies tided to shore with 200 feet of line. After Jeff’s cold swim, this is now an item on his wish list. Jeff and Leigh retrieved Leigh’s prawn trap today. In it they found three scallops but no prawns. We all try our luck at fishing but catch only a few small rock fish. 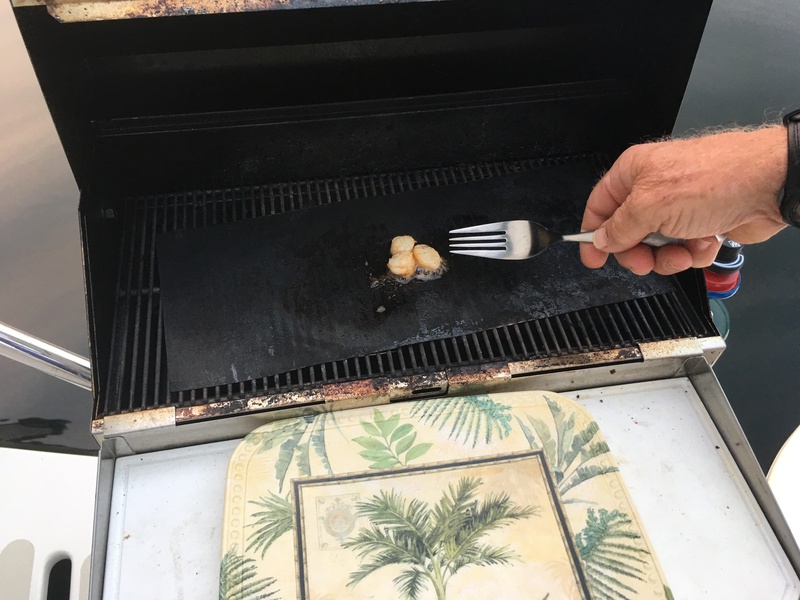 We do however enjoy a great meal with Wendy and Leigh of salmon (from our Campbell River catch) along with the three scallops caught earlier today. We are up early for our transit of Upper and Lower Okisollo Rapids, only three miles from the anchorage. Like Surge Narrows, these rapids also need to be transited at slack. Our Waggoner Guide book states “ The rapids running at 9 knots are freighting to watch. A wall of white water stretches across the channel until slack”. We have run white water rapids in our kayak but I don’t think it would be too enjoyable in Idyll Time. For some reason our tides and currents book shows slack time 20 minutes earlier than slack according to our computer program. Which is correct? We ease up to the rapids at the earlier time and everything looks pretty good. Forever Exploring takes the lead and we follow behind. There is almost no current and it is a very easy transit. Looks like our Tides and Currents book was correct on these rapids. 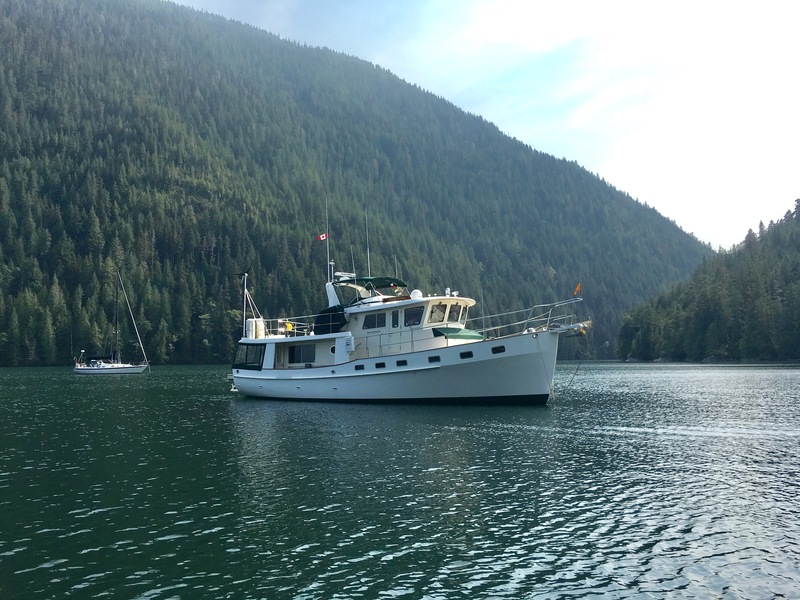 Once through the lower rapids, Okisollo Channel brings us back out into Johnstone Strait. We have a favorable current and the Strait is calm this morning. It is always hard to judge what the wether will be like on Johnstone Strait until you are actually there. The Canadian Weather service announces wind warnings on the Strait every day. 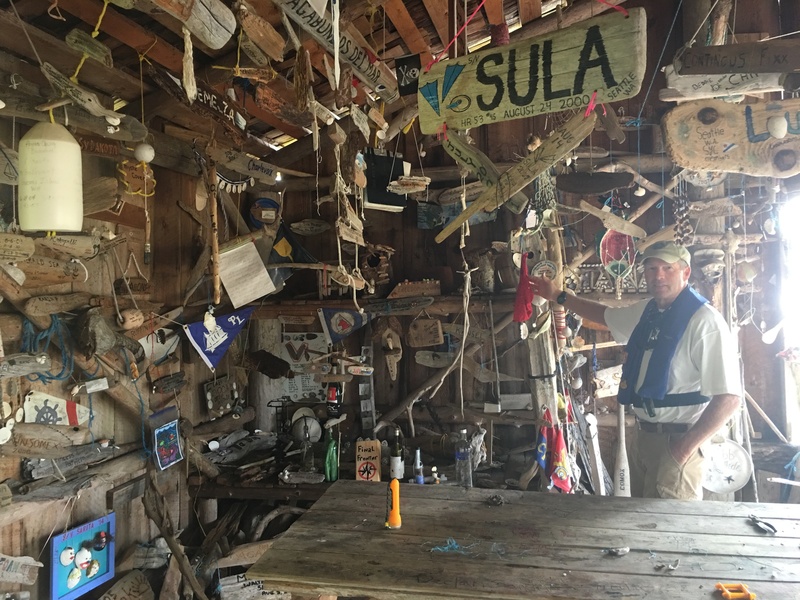 We were told that several years ago the weather service missed the forecast of high winds and a boater had died. They were sued over this so now every forecast includes a high wind warning. We bypass our two bail out options and continue twenty miles north to Chancellor Channel. We see our first bears of the season. We first spot a black bear wandering along one of the Islands’ shore and shortly after, we see a grizzly bear on a second island. Our second rapids of the day are just up Wellborn Channel. We circle for about half an hour waiting on slack at Whirlpool Rapids. These rapids only reach speeds of seven knots and have a fairly straightforward approach. We take take these rapids a little early and have only two knots of current. There are still some good whirlpools which grab our bow and alter our course. Forward Harbor, our anchorage for the evening is just past the rapids. The narrow entrance opens up to a long two mile long harbor surrounded on three sides by the steep mountains thick with fir trees. We anchor in Douglas Bay just beyond the small beach in 60 feet of water. 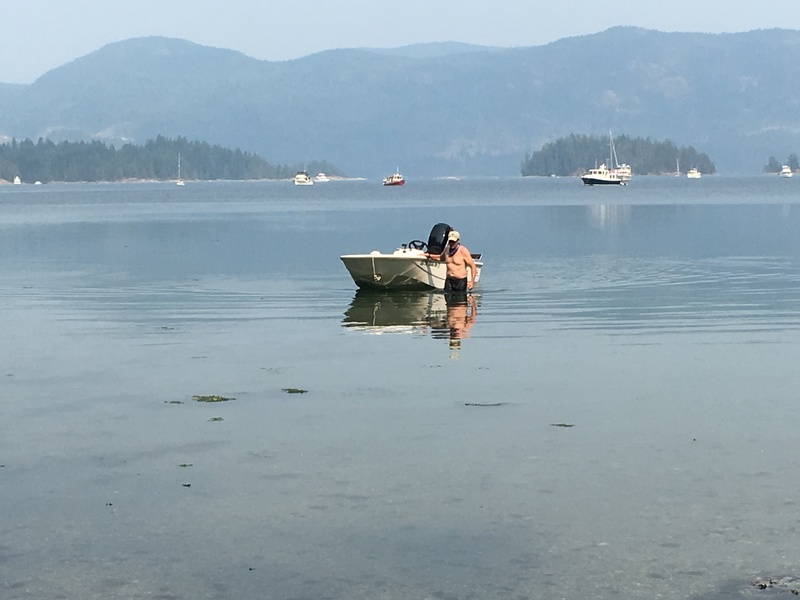 After setting out our crab traps, we go ashore and hike the short trail over to the next bay. We carry our bear spray with us today but never see any bears. We check the traps before dinner only to find one rock crab in each trap. Looks like it will be hamburgers for dinner tonight. Tomorrow we will reach the Broughton Islands. I am sure we will both sleep better tonight knowing we have the rapids behind us. This entry was posted on August 14, 2017 at 3:22 pm. You can follow any responses to this entry through the RSS 2.0 feed. You can leave a response, or trackback from your own site.